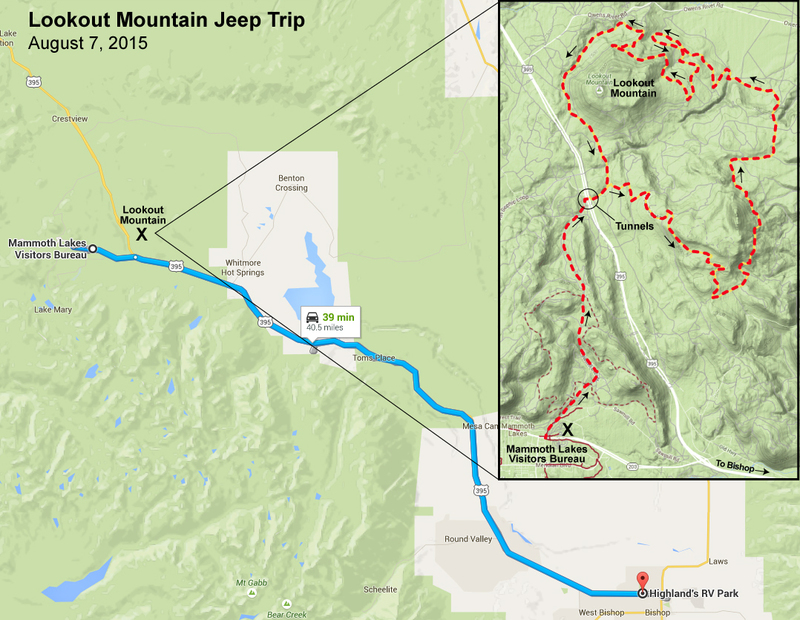 On Friday, August 7th, we took our Jeep up to Mammoth Lakes and rode the Lookout Mountain Loop in the Inyo National Forest. It took about an hour to get there and the loop itself was about a 3-hour drive — it was slowwwwww driving most of the way because the trail was rough or very steep. So I drove very slowly at times because I was concerned about the sheer drop offs alongside many parts of the loop. The loop was rated “beginner” and for the most part it was — except for one steep drop (see movie below). Most of the trip was like driving through the center of a forest and sweeping vistas were difficult to find because of the tall pines. However, snapped a few pics of some great views . . .
Yikes.. did you drive down that extremely steep slope?? Yep. I backed up the Jeep, put it in 4WD Low, and down we went. It was fun. I was supposed to film the drive down, but the jostling from the the plunge caused the film to jerk up and down so much that I guess I filmed mainly my leg. It was like a really bumpy roller coaster! We took a thermal shower in the area….maybe red’s meadow??? Or a place nearby…..whew…. Warm! Beautiful area…..but aren’t they all!